The construction statute of repose currently provides a strong defense for many asbestos litigants, and bars legal actions brought more than 10 years after an act or omission arising from the “design, planning, supervision, observation or management of construction, or construction of an improvement to real property.” 735 ILCS 5/13-214(b); Witham v. Whiting Corp., 975 F.2d 1342, 1344 (7th Cir. 1992). The statute of repose can not only improve a defendant’s chances at dismissal, but it can also enhance that party’s effective bargaining power. While it is not clear that the bill will actually become law, the implications of passage are enormous and far-reaching. Opponents of the bill argue that broadly eliminating the ten year statute for asbestos claims unreasonably expands liability and encourages an anti-business mentality. Indeed, the bill may create nearly unlimited liability given that exposures to asbestos frequently date back as many as fifty or sixty years. This will not only increase the potential liabilities of current Illinois asbestos defendants, but will doubtlessly draw previously untouchable parties – many of whom have not been in business for decades – into the litigation. Illinois Republicans are united in their opposition to the bill, and it would likely face a veto by Republican Governor Bruce Rauner should it pass the Senate. However, with the number of Democrats in the legislature, there is a strong change of overriding any veto. Illinois may therefore be just a few votes away from earning the dubious “honor” of being the preferred jurisdiction to litigate stale asbestos claims. “Illinois House OKs more time for asbestos lawsuits.” The Associated Press, Dec. 2, 2014. 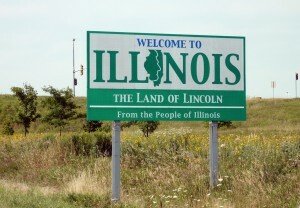 Are McLean County, Illinois Juries Trending in Favor of Asbestos Defendants? Despite a string of multimillion-dollar jury verdicts in favor of plaintiffs, asbestos defendants may now have a friendlier forum in McLean County, Illinois. Recently, after a three-week trial, it took a McLean County jury just one-and-a-half hours of deliberation to reach a verdict for the defendants in a forum that was once placed on the “Judicial Hellholes Watch List” by the American Tort Reform Foundation. The decedent in McGowan v. Illinois Central Railroad (Case No. 08-L-12) was a former rail yard worker. The plaintiff in McGowan alleged the decedent was exposed to and came into contact with asbestos-containing products of Sprinkmann Sons Corporation of Illinois, an insulation contractor, while working at Illinois Central Railroad. In light of the testimony from the decedent’s brother that he could not specifically remember Sprinkmann or any other insulation contractor being at the Illinois Central Railroad yard, perhaps the verdict for the only two remaining defendants in the case should not be a surprise. After all, Judge Rebecca S. Foley had granted a defendant’s motion for a directed verdict at the end of the plaintiff’s presentation of evidence on the product liability claim, with only the plaintiff’s spoliation of evidence claim proceeding to the jury. What may be more remarkable is that the verdict for the defendants was the third such verdict recently reached for Sprinkmann in asbestos cases in McLean County, according to HarrisMartin Publishing. Defense counsel in the McGowan case – Matushek, Nilles & Sinars LLC – also report three recent verdicts in favor of asbestos defendants in McLean County. The defense verdicts are significant in part because McLean County is not a high volume asbestos litigation forum and, therefore, the verdicts represent a good sample of cases in the county. To date, only eleven asbestos cases have even been filed in McLean County in 2014. Asbestos plaintiffs in McLean County have generally worked for Union Asbestos and Rubber Company (UNARCO), Sprinkmann, and Illinois Central Railroad in Bloomington, Illinois. UNARCO filed for Chapter 11 bankruptcy in 1982. However, in recent years, plaintiffs had been focusing on peripheral defendants – defendants that manufactured products containing asbestos but had no direct relationship to the plaintiff through employment or alleged exposure. In order to establish liability in these attenuated circumstances, plaintiffs alleged civil conspiracy against defendants Owens-Illinois, Honeywell International, and Pneumo Abex. This resulted in multi-million dollar jury verdicts against these defendants, notwithstanding that plaintiffs had no evidence of exposure from the defendants’ products. For example, in Gillenwawter v. Honeywell International, the jury entered a verdict of a combined $89.6 million against Owens-Illinois, Honeywell, and Pneumo Abex. But, in following the Supreme Court’s ruling in McClure v. Owens Corning Fiberglass Corp., the Illinois Appellate Court Fourth District issued several decisions starting in 2011 that rejected the plaintiffs’ civil conspiracy theory and most likely paved the way for McGowan and the other recent defense verdicts. McClure v. Owens Corning Fiberglass Corp., 188 Ill. 2d 102 (1999); Rodarmel v. Pneumo Abex, L.L.C., 2011 IL App (4th) 100463; Menssen v. Pneumo Abex Corp., 2012 IL App (4th) 100904; Gillenwater v. Honeywell Int’l, Inc., 2013 IL App (4th) 120929, appeal denied by Gillenwater v. Honeywell Int’l, Inc., No. 116739, 2014 Ill. LEXIS 63 (Ill. Jan. 29, 2014); Garrelts v. Honeywell Int’l, Inc., 2013 IL App (4th) 120997-U. In these cases, the Fourth District held that the defendants were entitled to judgment n.o.v. due to the plaintiffs’ failure to present evidence of a conspiratorial agreement and failure to show the defendants had a relationship with plaintiffs sufficient to owe plaintiffs a legal duty to warn of the dangers of asbestos in defendants’ products. In the McGowan trial, Owens-Illinois, Honeywell, and Pneumo Abex were notably not a part of the case. After reversals in Rodarmel v. Pneumo Abex, L.L.C. and Menssen v. Pneumo Abex Corp., it appears that the trial court judges in McLean County finally received the message and granted the defendants’ motion for judgment n.o.v. of the $89.6 million jury verdict in Gillenwater v. Honeywell International, Inc. The trial court did, however, enter judgment against John Crane, Inc. in the case, as the plaintiff alleged he used Crane gaskets. The Fourth District affirmed the decision, and the Illinois Supreme Court denied the plaintiff’s petition for leave to appeal. The Fourth District also affirmed the McLean County trial court’s grant of summary judgment against the plaintiffs on the same theory in Garrelts v. Honeywell International, Inc. As the McGowan court granted the defendants’ motion for directed verdict, the Fourth District’s decisions may have forced asbestos plaintiffs in McLean County to abandon the civil conspiracy theory against peripheral defendants. Although two January 2014 jury verdicts of a combined $1.7 million were entered against the plaintiffs’ employer, these verdicts were reached on a different theory – the Federal Employers Liability Act. The current trend is a welcome departure from the previously excessive jury verdicts, with the Fourth District’s repudiation of the civil conspiracy theory being a likely catalyst of this change. Moreover, if McGowan and the other cases involving Sprinkmann truly are the start of a trend by McLean County juries to rule in favor of asbestos defendants under like circumstances, perhaps more defendants will elect to try their cases. Even if such defendants are not emboldened to take their case to a jury, the multiple recent rejections by McLean County juries of highly speculative claimed exposures with no direct relationship to the plaintiff would be very helpful “negotiation points” in assisting those defendants in obtaining dismissals prior to trial, or perhaps providing leverage during settlement negotiations. Ultimately, with a less plaintiff-friendly appellate court and more defense-friendly juries, asbestos plaintiffs may now be more hesitant to file cases in McLean County. Whatever the case may be, a new asbestos filing against a defendant in McLean County should no longer cause a defendant the alarm it once did. Madison County, Illinois, has long been a favored jurisdiction for plaintiffs to file asbestos cases, regardless of where they reside or where their exposure occurred. This trend has accelerated over the past three years, with thousands of asbestos filings there each year. Recently, new firms have begun filing there, encouraged by the prospects of favorable juries and favorable damages law. For example, Madison County set a record last year with 1,678 new asbestos case filings, more than any other jurisdiction in the nation, a 42 percent increase in filings since 2010. In the first quarter of 2014, out-of-state plaintiffs’ firms filed a majority of the new cases, a shift from 2010 when local firms held the majority. Recently, when Judge Stephen A. Stobbs denied four forum non conveniens motions to dismiss, Madison County sent the message – loud and clear – that it is open for business and welcomes new filings from out of state. Defendants in four different cases moved for dismissal based on forum non conveniens by arguing that Madison County was an inconvenient venue for the parties. Beacher (Brown) v. American Biltrite Co. (Case No. 12-L-1392); Warden v. Caterpillar, Inc. (Case No. 12-L-1065); Murphy v. CBS Corp. (Case No. 12-L-1141); and Hunt (Munsey-Hunt) v. 84 Lumber Co. (Case No. 12-L-1140). Under Illinois Supreme Court Rule 187(c)(2), a court that has jurisdiction over the parties and the subject matter involved “may nevertheless decline jurisdiction of a case when it is apparent that trial in another forum with jurisdiction over the parties would be more convenient and better serve the ends of justice.” Berbig v. Sears Roebuck & Co. Inc., et al., 378 Ill. App. 3d 185, 188 (1st Dist. 2007) quoting Vinson v. Allstate, 144 Ill. 2d 306, 311 (1991); see Il. S. Ct. R. 187. Each of the four motions was predicated on similar facts: (1) none of the plaintiffs lived in Illinois, let alone Madison County, and (2) none of the plaintiffs ever worked in Illinois, let alone Madison County. While venue was proper based on the presence of a Madison County defendant, the defendants argued that Madison County was inconvenient for all the parties and the witnesses involved, and the cases should be dismissed. Despite the obvious lack of connection to Illinois, Stobbs denied all four motions. Stobbs insisted that for defendants to meet their burdens under the motion, they must demonstrate which court would be the appropriate court to try the cases, whether such court would have jurisdiction and venue over all parties to the case, and whether this court would be more convenient to all parties to the litigation. Stobbs found that the defendants’ motions failed to adequately address which forum would be more convenient and how that forum would be more convenient to each and every party. The defendants argued that the standard is almost impossible to show when a plaintiff sues dozens or hundreds of defendants at a time (standard in asbestos cases), and essentially makes the forum non conveniens doctrine a dead letter in Madison County asbestos cases. These rulings herald that Madison County is “open for business” to asbestos plaintiffs, regardless of where the operative events took place. This is all the more concerning given that numerous out-of-state firms have recently filed in Madison County for the first time, and its asbestos docket has substantially increased over the past three years. As the West Coast becomes less attractive to plaintiffs because of legal developments in those jurisdictions, these decisions clearly solidify Madison County’s reputation as a venue of choice for plaintiffs nationwide. Three of the four decisions are being appealed. In their appeals, the defendants argue that Stobbs abused his discretion in denying the forum non conveniens motions in cases that have absolutely no connection to Illinois. The defendants maintain that these cases should be tried in the most appropriate forum, the one with the most connections to the case. As the Illinois Court of Appeals decides whether to overturn Stobbs’ decisions, Madison County will remain “open for business” for plaintiffs all around the country. Regardless of whether those plaintiffs have stepped foot inside the state, worked for an Illinois company, or come close to a product manufactured by an Illinois business, for now, they are welcomed with open arms in Madison County.